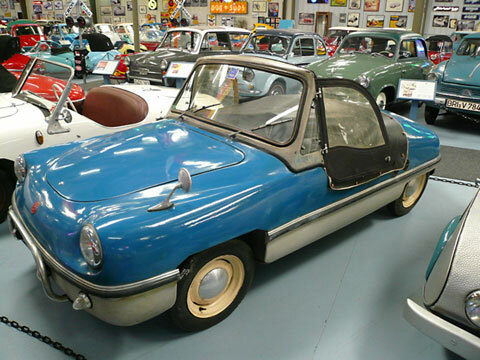 sold, but in the period of rising prosperity who wanted to still build a 250cc car? Reportedly, the head of the firm: BURGFALKE,DAHMEN had tried aircraft and now wanted to be in the Automobile business. In Nürnberg, he said he wished to buy everything that belonged to the Victoria 250. He had purchased an old glass factory in Bavaria and here was where the car known as the "Burgfalke Export 250" would be built. The press was told that future versions would have side doors and front and rear bumpers, a larger engine and so on. But Burgfalke was having troubles paying for the remaining 180 Victoria Bodies and parts and production soon ceased after some handbuilt versions were made. So few "Burgfalke Export 250s" were built that there is not an accurate account of the number that managed to emerge from the factory and books that chronicle the history of the Spatz and Victoria only mention Burgfalke as a footnote. At least Two were originally shipped to the USA to dealers, this car is one of those. It still has the original cloth top and packaging from the dealer under the front hood.